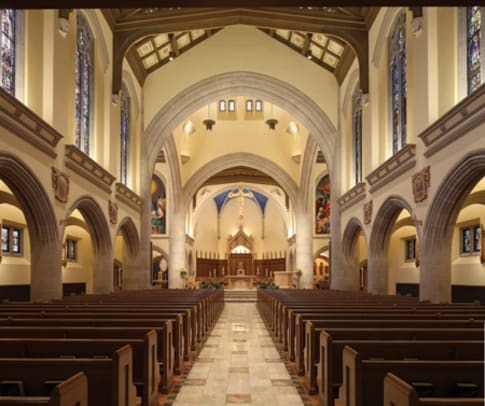 When Thomas Celli of Celli-Flynn Brennan Architects and Planners (CFB) of Pittsburgh, PA, took on the project of renovating the Blessed Sacrament Cathedral in Greensburg, PA, it was part of a family tradition. His father had done a renovation in 1971 following Vatican II. But the history of this particular church goes back much further than that. The original church was built of logs in 1789, and was replaced with a 30x70-ft. brick church in 1846 by the Order of St. Benedict. The Benedictine priests assumed responsibility for the parish for the next 100 years. A third building, (45x100 ft.), was built of brick and natural stone in 1887. By the 1920s, the parish realized that a larger church was needed, and the current building with its buttresses, pointed arches and vaulted roofs was dedicated in May, 1928. It is made of Indiana limestone and sandstone and was designed by the Pittsburgh firm of Comes, Perry and McMullen. This Romanesque/Early Gothic church became a cathedral on March 10, 1951, when the Diocese of Greensburg was created by Pope Pius XII. Twenty years later, in 1971, Mario Celli, FAIA, founder of CFB, led a renovation that "modernized" the church following Vatican II. The altar was moved from the apse to the transept, and the original baldacchino was dismantled and its Breccia Pernice marble columns were sliced into slabs to adorn the floor of the predella. Tom Celli got involved in 2004 when the diocese asked his firm to complete a series of studies on further beautification of the cathedral and ADA accessibility. Following the completion of these studies, CFB was retained to carry out the restoration. "At the direction of Bishop William Connare, the 1971 restoration took out the old altar and baldacchino and did away with the communion rail," says Thomas Celli, AIA, president of Celli-Flynn Brennan. "Now the trend is back to traditionalism. Our new bishop, The Most Reverend Lawrence Brandt, JCD, Ph.D, wanted a more traditional church in keeping with the Romanesque style." The restoration of the 22,000-sq.ft. cathedral, completed in 2011 at a construction cost of $2.8 million, involved both interior and exterior work. The general contractor was Volpatt Construction of Pittsburgh. The first step in the process was to create an artistic scheme for the cathedral. The bishop, a former Vatican official with extensive knowledge of European art and architecture, asked EverGreene Architectural Arts to create a plan for renewing the building. "We were brought in early," says Jeff Greene, president, EverGreene Architectural Arts. "They wanted us to come up with a complete vision for the interior. We started by looking at historic photos and we spent a lot of time there, getting the feel of the space and taking cues from what was there, including the history. If you listen to the building, it will tell you what is needed. We wanted to bring that back as much as possible." "The building&apos;s architecture influenced the decisions greatly," agrees Celli. 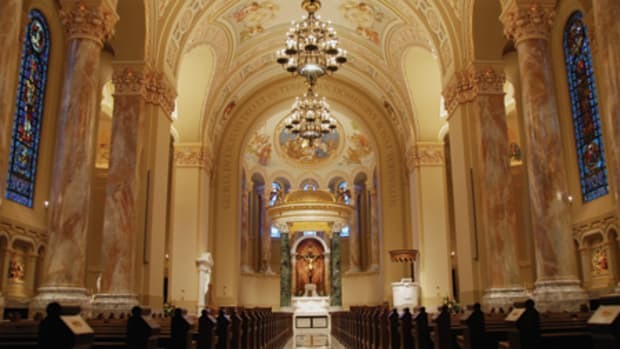 "The goal was to create an interior appropriate for the Romanesque style of the cathedral. The bishop wanted to get back to traditional architecture and liturgical furnishings, in keeping with a richer, more sacramental series of ceremonies." In addition to ecclesiastical design, EverGreene also designed and executed the decorative painting, created the plaster ornament and painted three new murals for the cathedral. "We did a lot of design work and then selective implementation," says Greene. "The idea was to respect the space and renew it as sympathetically as possible." The apse, for example, was bare when EverGreene went to work on it. 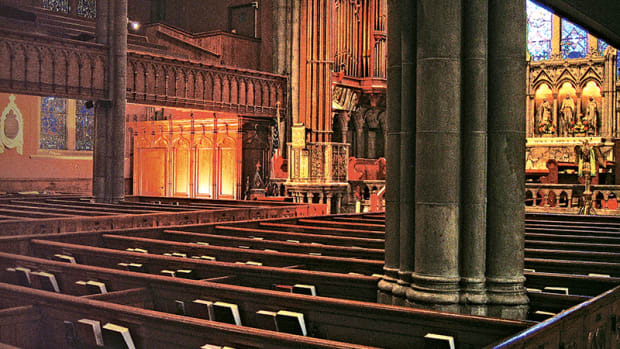 "The interior, including the apse, had been stripped in the 1970s renovation," Greene says. EverGreene designed the new cathedra, and then sculpted it and cast it in plaster. This was then shipped to Italy where it was carved by machine and hand finished. "There was concern about the machine carving so the sculpted image gave the carvers an exact replica to follow," he notes. In addition to the new cathedra, EverGreene also designed and built the new cathedra canopy and the altar screen. All are plaster that is painted to look like stone or wood. "The cathedra was modeled after the Basilica of Santa Maria in Cosmedin, Rome, Italy, where Bishop Lawrence Brandt said his first mass," Celli notes. The final touch in the apse was the ceiling. Plaster ribs designed and painted to look like stone were installed in the previously unornamented ceiling and the ceiling was painted to represent a starry, midnight blue sky. In addition, Celli-Flynn Brennan designed chairs for the apse, to provide seating for up to 70 people. These were built byRatigan Schottler Manufacturing of Beatrice, NB. EverGreene also highlighted the beams in the nave with stencils, and painted and cleaned the interior throughout. Three new murals were painted specifically for the cathedral and new frames for the Stations of the Cross were designed and built by EverGreene. Like other ornamental elements, the frames are made of plaster painted to look like wood. "The Stations were actually quite small," says Greene. "We added frames so they would fit into the building and style of the cathedral." New marble liturgical furnishings designed to coordinate with the existing marble altar were added. These include the presider&apos;s chair, the ambo and two credence tables and a carved wooden lectern. The marble furnishings, including the presider&apos;s chair and the ambo, were created by Sacred Spaces, Inc., Alexandria, VA. Portions added to the altar such as the central panel and other fretwork were carved byGregory Muller of New York City. The ends of the altar were recycled from the previous one. The new crucifix, designed by EverGreene, now hangs over the altar. Greene points out that it is loosely based on the Cimabue crucifix at Santa Croce in Florence, Italy. In addition, a new baptismal font that matches the marble capitals of the original baldacchino was installed in the north transept. And a new ornamental pierced bronze grille and ambry fabricated by New Guild Studio of Braddock, PA, holds the sacred oils in the south transept. In the nave, all of the woodwork including the pews, confessionals and the paneling at the rear of the nave and in the narthex was refurbished. The new work was manufactured by Nagele Manufacturing of Brook Park, OH, and installed by Volpatt Construction, while the pew restoration was done byRingler Restoration of Greensburg, PA.
Apostolic shields depicting the crest of each bishop that has served the diocese since its inception were added beneath the stained-glass clerestory windows. They were sculpted and painted by EverGreene, and some were left blank for future bishops. Flooring was also updated. A patterned marble floor replaces carpet throughout the aisles of the cathedral. Under the pews, a diamond-patterned, two-toned cork floor was installed. "The new flooring improves the acoustics of the cathedral," Celli explains. Massaro Industries, of Oakmont, PA, installed the cork and J.P. Phillips installed the marble flooring. "The cork flooring got a lot of attention," says Celli. "Cork has been in use in churches more than 100 years. Many objected to it at first, since stiletto heels will create slight indentations, but they do not really damage it. Cork is very easy to maintain – just mop it once in a while – and it will last for generations." The stained-glass windows in the cathedral were refurbished by Hunt Studios of Pittsburgh. In the balcony, the plaster columns supporting the wood pipe organ cabinets were ornamented with fluted wood panels, ornate column capitals and carved trefoil appliqués. Lighting in the cathedral was replaced with energy-efficient fixtures and historically styled chandeliers selected by the bishop. Rambusch built the downlights in the nave and the four custom chandeliers in the crossing above the altar. 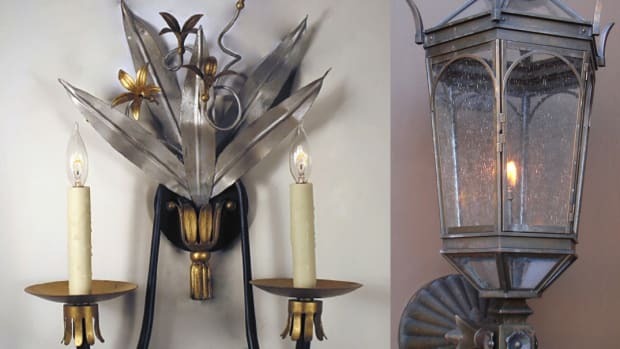 Ornamental sconces were also added. One of the major changes was the addition of four grand cast-bronze doors – two at the main entrance leading into the narthex and two single doors on each side of the building. Also part of EverGreene&apos;s design scheme, the main entry doors replace glass doors that had been installed in the 1971 renovation. The new doors were made by Ellison Bronze of Falconer, NY, with bronze inset panels created by Matthews of Pittsburgh. Each door weighs 700 pounds and contains six bronze panels, three on the front and three on the back. The inspiration for the design of the inset panels came from the original communion rail gates in the stone communion rail that had been removed in 1971-72. The construction incorporates balanced pivot hinges at two-thirds of the width of the door, distributing the weight so the doors are easy to open. "Our balanced entry system is a perfect match for Blessed Sacrament Cathedral," says Mark Graves, president, Ellison Bronze. "Each door leaf is made of heavy-gauge formed muntz bronze door panels with custom cast-bronze inserts. Thanks to the balanced entry system, the weight is distributed to the balanced hardware and ultimately to the floor. The weight of each leaf is truly balanced to allow the user to open the door with relative ease given the extreme weight." Hunt Studios fabricated the stained-glass Bishop&apos;s shield over the double bronze doors and Pittsburgh Stained Glass did the sidelites for the single doors. On the exterior, CFB completed a report on the condition of the masonry and roofing systems and made a series of recommendations. The exterior was re-pointed and cleaned by Raimondo, Inc., Greensburg, PA. The Blessed Sacrament project was under construction for approximately nine months, Celli says, and "the building was never closed. We added scaffolding and kept it open throughout the renovation." During a recent visit to the Diocese, Archbishop Carlo Maria Vigano, Papal Nuncio, told the congregation how much this cathedral reminded him of his boyhood church in Italy that had been destroyed by bombs during WWII. He said that when he stepped into Blessed Sacrament, he realized that he "had come home." This project is one of several traditional churches updated by CFB. 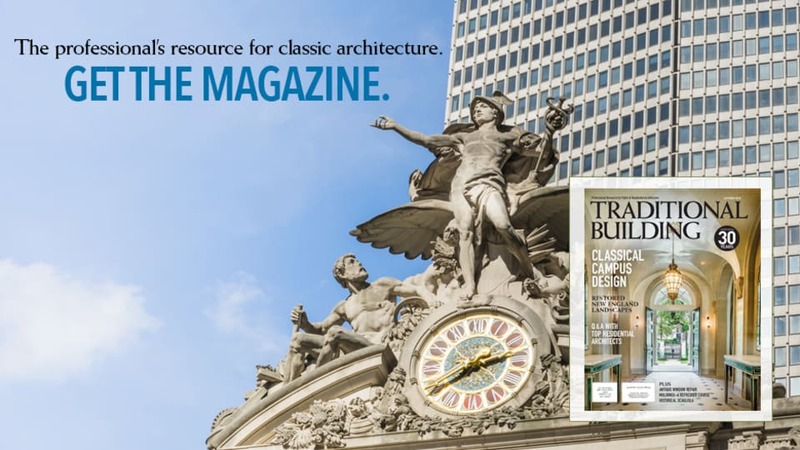 Celli notes that the AIA gives Timeless Awards for buildings that are more than 25 years old. "We just won our second one in three years for a small chapel at Seton Hill, in Greensburg. It is now 51 years old and is doing just fine. It has stood the test of time, and I know this Blessed Cathedral will stand the test of time as well." 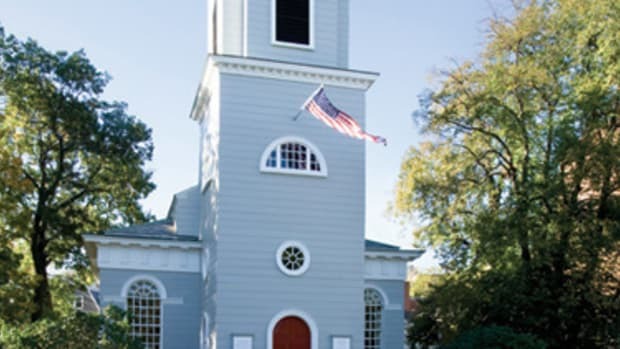 Frank Shirley Architects and Charlie Allen Restorations restored the exterior of the historic Christ Church in Cambridge, MA.